More than 20 years ago. WATER-JEL introduced water-based gel technology that revolutionized the emergency first aid treatment of burns. Today, WATER-JEL is used by EMS and industrial health and safety professionals around the world. 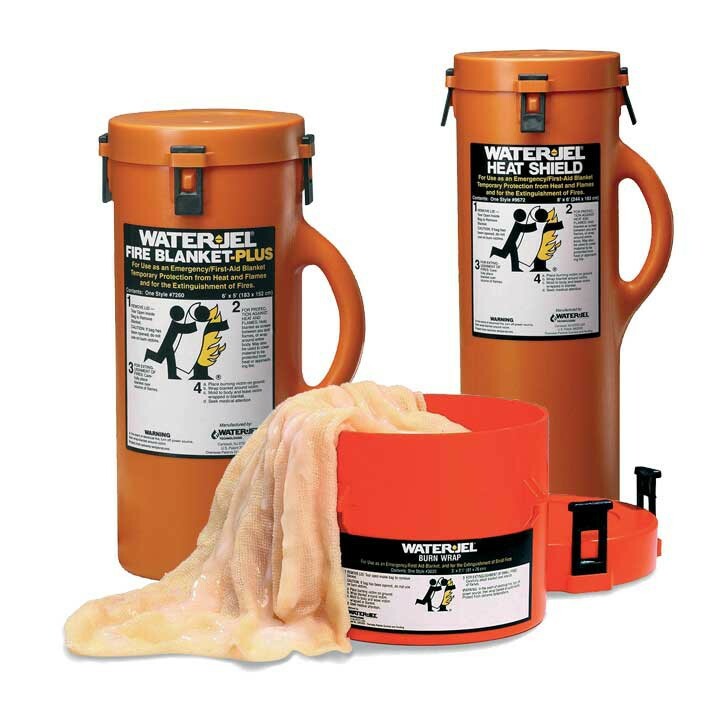 WATER-JEL Burn Kits offer different combinations of Burn Dressings, Burn Wrap/Fire Blankets and Burn Jel® so you’ll be prepared for any Burn Emergency. The 'Immediate Cooling' of burns is recommended by most EMS protocols and curriculum. 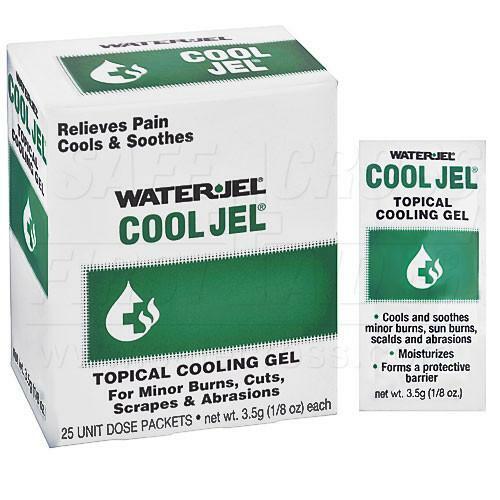 WATER-JEL burn care products utilize a thick water-based gel-proven to dissipate heat and cool burns, quickly relieve pain, help stop burns from progressing deeper into the skin and help prevent infection. WATER-JEL Dressings and Fire Blankets can be used on all burns. put out smoldering clothes, relieve pain, cool the burn, and protect against airborne contamination. The gel is water soluble and can be easily rinsed off for further medical treatment. The blankets can also be used to put out fires and protect a rescuer from heat and flames. Wall mounting brackets also available. Medical Device contains no active ingredients. Gel-soaked Burn Dressings cool the burn, relieve the pain and protect against airborne contamination. Consist of a medical grade non-woven pad, in a water based, water-soluble gel, Won’t stick to burn injury. Available in 6 sizes: 2" x 6", 4" x 4" , 4" x 16", 8" x 18", 12" x 16", 8" x 20"
Facial dressing with pre-cut holes for eyes, nose and mouth. 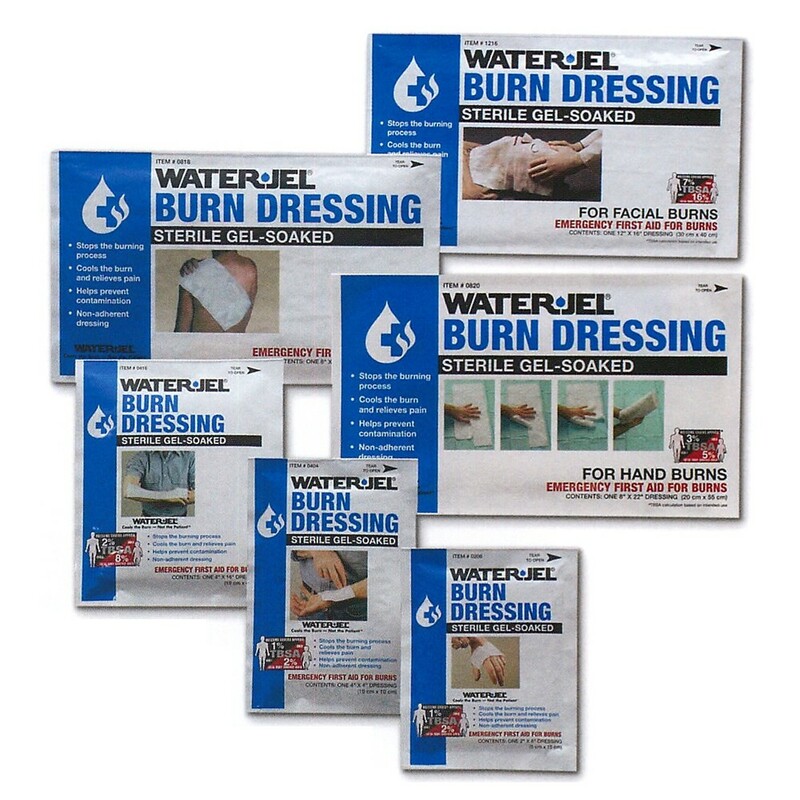 Assortment of Water-Jel Burn Sterile Burn Dressings, Burn Wrap, Fire Blankets and Burn Jel. These different kits are configured for specific industries. Can be utilized for most industrial, institutional and medical emergencies. All Water-Jel Burn Care Kits come in handy transport- and storage bags. A burn emergency can strike at any time—whether in a food service location, such as a fast food facility or cafeteria, a manufacturing facility, a refinery, outdoors in the field or even in a training classroom. It’s crucial to be prepared to deal with that accident when it happens. All Water-Jel Emergency Burn Stations are manufactured from durable, wipe clean plastics. Thick gel cools and soothes minor burn injuries and relieves pain. Helps dissipate the heat and protect injury from infection.